Posted May 30th, 2016 by Sarah Taylor & filed under Expert Tips. If you have called us about replacing a broken window crank in your window these are the instructions to measure the crank. Please remove the screen from your windows in order to give us the clearest picture. 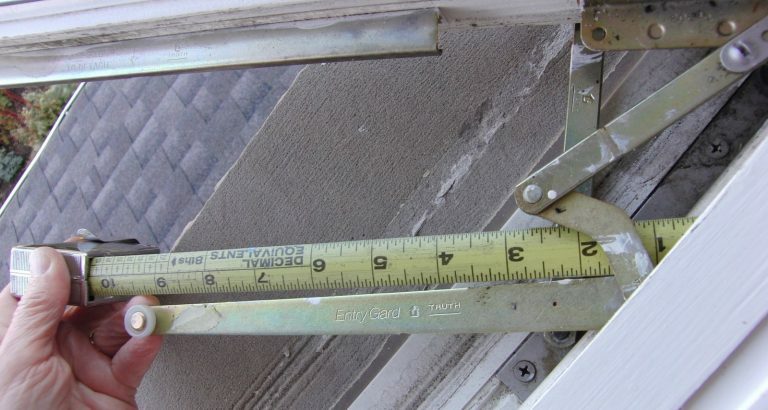 If you CANNOT open the crank, or do not want to because you won’t be able to close it, please do these measurements on another window of similar size. We just need to know the orientation (left or right as you are looking from inside – for reference, the window in the above photos opens to the RIGHT) of the broken crank. Email us (click here) with your photos and we can coordinate the replacement of your cranks. The pictures on this page are courtesy of our valued clients, George and Glenna. Thank you so much for your great photography skills! Online Quote system? How does THAT work? Windows sweating or iced up in winter? You DON’T need new windows! 10 Tips.